Adelphi’s collection of over 50 African ceremonial implements were donated by Mr. and Mrs. Frederick and Claire Mebel (Adelphi Alumna, 1938). Frederick and Claire Mebel became impassioned by modern art, Oceanic, Pre-Columbian, Japanese woodblock prints, Native American and later African art. The Long Island natives collected together, frequenting galleries and auction houses in New York and Europe. Claire Mebel, (1916-1993), neé Messing, who attended Adelphi University majoring in French and Latin, graduated in 1937. Frederick Mebel, (1913-1998), was a graduate of Dartmouth University, where he watched Mexican mural-artist, Jose Clemente Orozco paint the "The Epic of American Civilization" on the Baker Library walls. After graduating in 1935, Frederick Mebel entered the army and fought in World War II, while Claire cared for their first child. Upon his return from the war, Frederick Mebel started his dermatology practice in Rockville Centre. Their desire for a cohesive collection began upon viewing a friend’s collected works. Until then, collecting was merely for decoration, however, it grew to a beautiful example of love and togetherness. It started with 20th Century American and European art. Works by Picasso, Matisse, Calder, Dubuffet, Bellows, Lichtenstein and Stella were collected and widely exhibited including a brief stay at Alumnae House at Adelphi University in 1984. As time passed the collection transformed and culminated with African metal implements- swords, knives, axes, and wooden sculpture. They gathered works from prestigious galleries and auction houses in Europe that had colonies on the African continent. The Mebels acquired their pieces before most New York City galleries and their collection became highly sought after. Their collection was dispersed among some of the top institutions. Works were hand selected by curators from the Metropolitan Museum of Art, while others were donated to the Smithsonian Institute, Dartmouth’s Hood Museum, Emory University and Adelphi University. Their sculptural quality was their main appeal. As Claire Mebel said in an article from Newsday in 1988, “They expressed their everyday living in fine art. 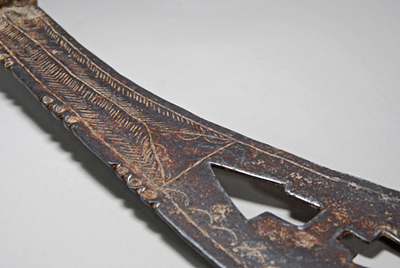 This intricately designed sword is created by the Ashanti as a chiefly or priestly regalia. It is used as insignia of a particular profession, or functions as a standard of wealth. Those with authority use and carry such implements, i.e diviners, healers, counselors, master craftsmen, and judges.